It's just over a week until Ross County hit the A9 and all B roads' off it south to Hampden Park for the biggest game in the club's history - their Scottish Cup Final showdown against Dundee United. The whole of the North Highlands is buzzing and we're guessing that not much else will happen this week beyond Inverness. The Staggies really are on the Way. And talking of which the iTunes single which we've been helping promote is dues for release on Monday morning. 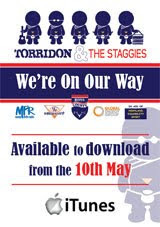 Anyway both of the banners below link directly to the page selling Torridon & The Staggies "We're On Our Way". We've also asked Ross County fans to download and print a poster (right) to encourage sales from Monday. That can also be downloaded from here.